PBPK – what it is for? In addition to lab work also various modeling tools have developed rapidly in the last decade to support drug discovery and development. 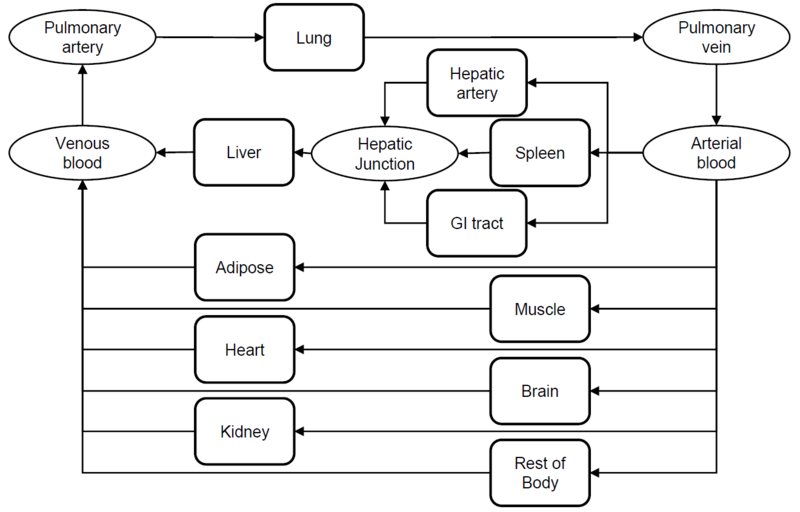 One interesting modeling tool is PBPK, physiologically based pharmacokinetic modeling. To elucidate the topic further we interviewed an expert in the field, Dr Aki Heikkinen. For what kind of applications is PBPK a valuable tool? PBPK is a versatile tool and has many applications. First of all it is a tool to integrate the existing in vitro and in vivo data into predictions of in vivo pharmacokinetics (PK). PBPK can be used to guide experimental work and prediction of PK behavior of the new chemical entities in animals and in humans prior to conducting corresponding experimental study. PBPK can also be used for evaluating if existing in vitro data and knowledge on pharmacokinetics is enough to understand the mechanisms dictating the behavior of the compound in question. A validated model can be used for predicting PK in scenarios that have not been tested experimentally or are not feasible to test experimentally. Such applications include simulating the impact of age or ethnic diversity on pharmacokinetics or alternatively to evaluate potential clinical DDI risk. What kind of data is required as an input for PBPK modeling? One cannot give a conclusive list of required data inputs that applies for all cases, as it depends on the questions to be answered and the key mechanisms dictating the PK of the given compound, but generally a comprehensive set of high quality data regarding the compound of interest, including both in vitro and animal in vivo data. It is important to know the metabolism and the primary routes of elimination, not necessarily on enzyme level, but at least on organ level. Also information on physicochemical characteristics, like pKa, solubility, lipophilicity and plasma protein and tissue binding are needed. Early models may be built using in silico predicted input parameters and existing in vivo PK data is used as a reference to evaluate the performance of the model. This may include animal and also clinical data, depending on the stage of development of the compound. The mismatch between simulations and existing in vivo observations show there is something we do not understand well enough yet and simulations with the model can be used for exploring what might be the data we are missing. How long does it take, on average, to complete a PBPK modeling project? It totally depends on the questions one would like to be answered with modeling. If we have an existing model, a set of simulations can be done within one working day and most of the time goes into planning before the simulations and analysis of the results after the simulations. Usually the process begins with model generation and the time it takes depends on the number of data sets we have as a background and how the compound behaves; if it is functioning well with basic assumptions a useful model can be built within a week or less. Naturally the more questions one has, the longer the project takes and in ideal case building the PBPK modeling is started early in pre-clinical development and the model can be updated and refined during the process, all the way until late clinical phases, including DDI evaluations and inter-population explorations. SimCYP, GastroPlus or alternative options – what are the differences between the programs? There are a few options available. We use GastroPlus™ by Simulations Plus, but also for example PK-Sim® is commercially available, while Simcyp Simulator is currently not available for CROs. Also additional models have been built using general purpose mathematical modeling software, such as MatLab and Berkeley Madonna, which are more used among academic researchers. A strength of commercial software packages is the availability of built in physiologies that have been tested with a number of compounds. How about regulatory authorities, is PBPK modeling accepted as a part of regulatory submission? PBPK modeling is appreciated by regulatory authorities and for example current regulatory DDI guidance do refer to PBPK modeling. Both FDA and EMA have released the draft guidances on PBPK modeling in 2016 and I expect further recommendations on best practices still to come from both regulators and the industry. In which applications PBPK brings most cost/time savings? One can say that generally the biggest savings are in clinical development. For instance, DDI simulations can be used to support and rationalize clinical DDI studies. In preclinical development PBPK can be used to select the “best compounds” for clinical development, minimizing the cost of taking “wrong” compounds forward. The cost of taking forward the compounds that eventually fail can be calculated but the cost of erroneously eliminating the good compounds is not easy to estimate. We have also published one poster about “Physiologically based pharmacokinetic modeling of oxycodone drug-drug interactions”. You can download the poster from our material portal.